Project partner Global Robots fine-tunes one of LASIMM’s robotic arms, which is part of the massive 14m x 11m x 5m machine. Image courtesy of Loxin. You could call it Europe’s moon-shot of hybrid manufacturing. An international team of roboticists, software developers, machine engineers and others has brought the Large Additive Subtractive Integrated Modular Machine (LASIMM) project online and it’s ready to start building. Housed at Loxin’s facilities in Pamplona, Spain, LASIMM is one of the world’s largest hybrid manufacturing machines, featuring unique metal additive and subtractive capabilities. It will be capable of 3D printing metal parts and structures for construction as large as 6 meters by 2 meters in diameter and up to 2000 kilograms in weight. Reducing costs, improving efficiency and production flexibility are core pillars to improve Europe’s industrial competitiveness. As part of a major initiative to address this, theEuropean Union’s Horizon 2020 research and innovation program has funded 10 partners from six countries to produce a machine that can manufacture components for the most demanding industries, all directly from CAD models. In addition to Autodesk, five other companies, two universities and two research institutes from Belgium, the UK, Denmark, Spain, Germany and Portugal are collaborating on LASIMM based on a scalable open architecture framework with associated software, enabling full parallel manufacturing. 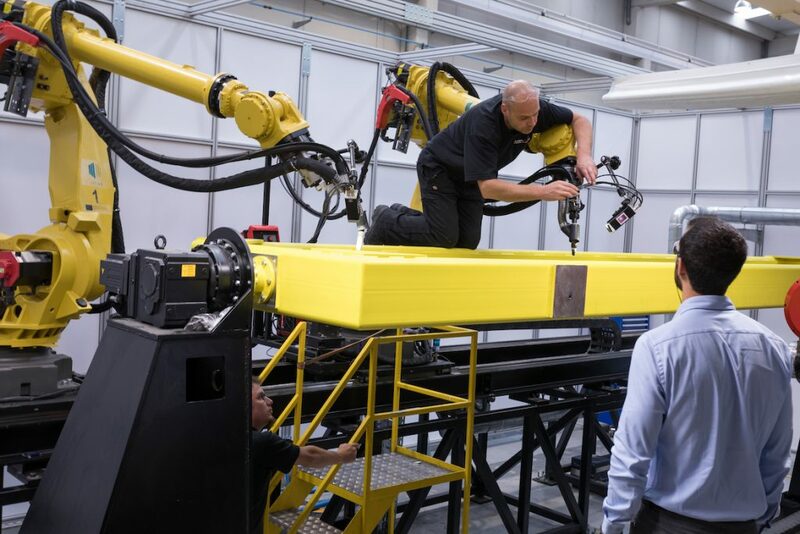 The machine will now be tested to manufacture demonstrator parts, such as large cantilever beam structures, airplane panels and wind turbine parts. These have been designed by leading industrial end-users to take the machine’s capabilities to the limit. It features capabilities for additive manufacturing, machining, cold-work, metrology and inspection. These technologies provide the optimum solution for the hybrid manufacturing of large engineering parts and deliver a projected 20% reduction in time and cost expenditure, as well as a target 15% increase in productivity for high-volume additive manufacturing production. A view of the CAD design of the LASIMM in Autodesk PowerShape. Image courtesy of Loxin. 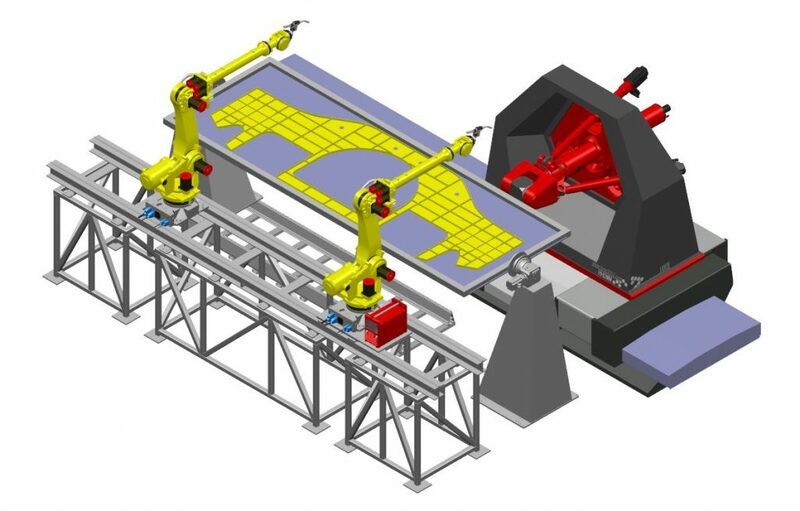 Learn more about Autodesk’s robot control software. As the project’s lead software partner, Autodesk is pushing manufacturing boundaries from a single-machine-single-process CAM towards a multi-machine-multi-process CAM, driving hybrid machines where multiple processes are combined to manufacture the end-component. Its technology plays a key role throughout the multiple manufacturing processes by creating toolpaths while the part is in build. The other partners all bringing vital expertise to the project include the European Federation for Welding, Joining and Cutting, BAE Systems (Operations) Ltd., Foster + Partners Limited, Vestas Wind Systems A/S, Cranfield University, Global Robots Ltd., Loxin2002 S.L., Helmholtz-Zentrum, Geesthacht Zentrum fur Material – und Kustenforschung GMBH, and Instituto Superior Técnico. Despite the cultural differences that come with such a diverse group, the team members have bonded over wine and pintxos in the evenings after the long days prepping and operating the LASIMM together. For Europe’s future industrial competitiveness, the LASIMM project represents a mighty leap forward for hybrid manufacturing and will enable many countries to produce far larger materials, both more quickly and cost effectively. The project has brought hybrid manufacturing to a truly global and industrial scale. To date, 3D printing has been limited to smaller components and is often seen as an expensive option. But the technology, both software and hardware that has been implemented within this project, shows that it is now ready for bigger things. From rendering to reality: the LASIMM project is now live and starting to manufacture large-scale parts. Image courtesy of Loxin. “While 3D printing for consumers and makers has received a great deal of publicity, it is within the industrial manufacturing and construction industries that this technology could have its most significant and lasting impact. 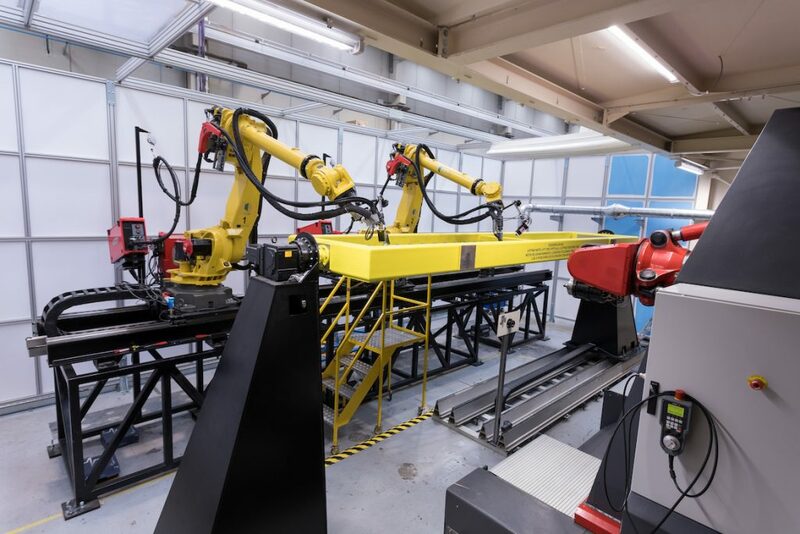 Its use has now reached a tipping point with the manufacture and assembly of one of the largest hybrid manufacturing machines in the world, a technological achievement that will pave the way to enable entire construction infrastructures to be 3D printed in the future,” said Eurico Assuncao, Deputy Director at European Federation for Welding, Joining and Cutting and the LASIMM project coordinator. “It’s fantastic that we’re able to showcase the technology’s capabilities to the world through the LASIMM project and we are excited to see the ground-breaking developments that the machine will support,” added Assuncao.